Organic Sales: Sales are 100% organic. 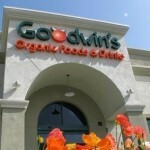 Goodwin’s Organics is always looking for small organic companies to support. As multinational corporations purchase organic businesses, the store discontinues those brands. Goodwin’s encourages low-income households to shop at their store by discounting 180 of their basic private- label products below their competitors’ prices. There are no GMO products to remove. There are no GMO products to label. Hey Congratulations and thank you for being in Riverside! This is an awesome store with a cafe and purified water system for the customers to refill their bottles. I highly recommend anyone to shop here. Great info. I will definitely checkout Goodwin’s. Thanks for providing so much useful information. Happy to find a store near me that is so dedicated!! !